Having established that scientific inquiry is the way to understand how our physical world works, I want to consider ways to understand how the spiritual world works. What? You may ask: A spiritual world? And I answer, Yes, for sure, a spiritual world. And I'm not one of those people who says, "I'm not religious, but I'm spiritual." I believe in God. (Follow that link to see some others of my beliefs, which all go with the initial one, believing in God.) Since many people think one can't believe in God and still be a scientist, or even be rational, I want to explain how this is possible. I believe there is a spiritual realm that scientific experiments can't discover, let alone explain. Yet I propose that all people, including rational people, can apply a method, similar to the scientific method, to establishing the reality of spiritual matters. ...a spiritual witness given by the Holy Ghost. The foundation of a testimony is the knowledge that Heavenly Father lives and loves His children; that Jesus Christ lives, that He is the Son of God, and that He carried out the infinite Atonement; that Joseph Smith is the prophet of God who was called to restore the gospel; that The Church of Jesus Christ of Latter-day Saints is the Savior's true Church on the earth; and that the Church is led by a living prophet today. With this foundation, a testimony grows to include all principles of the gospel. The quest for a testimony begins with a righteous, sincere desire. Speaking to a group of people who did not yet have testimonies of the gospel, Alma taught: “If ye will awake and arouse your faculties, even to an experiment upon my words, and exercise a particle of faith, yea, even if ye can no more than desire to believe, let this desire work in you, even until ye believe in a manner that ye can give place for a portion of my words” (Alma 32:27). First, "...rouse your faculties," i.e., think about it, seriously, not just like an idle question, like, I wonder why the sky is blue. Really use your brain to think about it. Third, let the results of your experiment influence what you do next, that is, desire to believe, show some faith that what you're experimenting on will have some results: And this of course is where our spiritual experiment differs from scientific experiments: The results of our experiment will not be anything visible or even immediately obvious, but will have to develop over time and with continued practice. Does praying work for this part of your life? Do you get answers that help you for that part of your life? Is the procedure working? If not, troubleshoot your procedure. If so, analyze the data and draw your conclusions. Then, as you see your results aligning (or not) with your original hypothesis, these results, your experimental data, become background research for the next part of your life. And, as we mentioned above, quoting the Church's information on testimony, "With this foundation, a testimony grows to include all principles of the gospel." We had drinking fountains set up above a long metal horse-trough-like structure in the playground of the school, where we could see what we called horse-hair worms in the stagnant water at the bottom of the trough, and we really did believe that those were horse hairs that had turned into worms. Why not? The fact that there were no horses anywhere near our playground didn't change our belief that horse hairs must have gotten in there, and then turned into those disgusting wiggly worms. So of course we wouldn't drink from that trough. But we weren't scientists, were we. We just saw what we saw: a bunch of long wiggly worms that were larger in diameter than horse hairs, and we saw no other way for those creatures to get there. Now that I'm thinking about this, though, I'm remembering that the girl who spread that rumor about the horse hairs turning into worms was also the one who told us, after the school finally installed real ceramic drinking fountains that drained the used water into pipes and away from there, that we still shouldn't drink from the fountain if a certain dark-skinned and black-haired boy drank first, because we would get his cooties. So, here's another way that superstitions and false beliefs get passed on: the knowledgeable person of the group, like Aristotle, or my blonde-haired and blue-eyed friend Marilyn, makes an authoritative statement, and we all believe it, and repeat it. Question: If I use the scientific method to decide what I believe in, then why do I object to other people's religious beliefs that are different from my own? Answer: I don't. I don't care what other people believe about God or not-God or clouds in the sky or fish in the sea. Zeus? Neptune? The great flying spaghetti monster? Or nothing at all? Go for it. I don't care, by which I mean, I don't judge you for your beliefs. As Jeff and I talked about hummingbirds' feet or lack thereof, we realized that a lot of old-time beliefs and superstitions can be explained by the lack of that essential part of the scientific method: information. If you are missing essential information, your conclusions are bound to be incorrect. So, you make a hypothesis, backed up by initial observations: because you don't see any feet on the hummingbirds you see flying around, many meters away from you, and you never see them landing or perching on anything, and these hummingbirds are remarkably different from all the other birds you've been watching all your life, you draw an obvious conclusion: they must not have feet. Or, let's say, one day a black cat crosses your path as you're walking down the street, and right after that you get run over by a horse-drawn cart. Obvious conclusion: black cats bring bad luck, whether you were so busy watching the cat that you weren't paying attention to the street traffic or not. Or, let's say, you walk under a ladder which proceeds to fall on you. Obvious conclusion: walking under a ladder brings bad luck. And so on. Pass these beliefs on to your kids, and, sure enough, they walk way out of their way to avoid black cats and ladders, and, miraculously, they remain safe. Case closed. On the other hand, let's say you are wondering about some idea that had been passed down to you from generations before, wondering because you've made some observations that seem to contradict that idea. 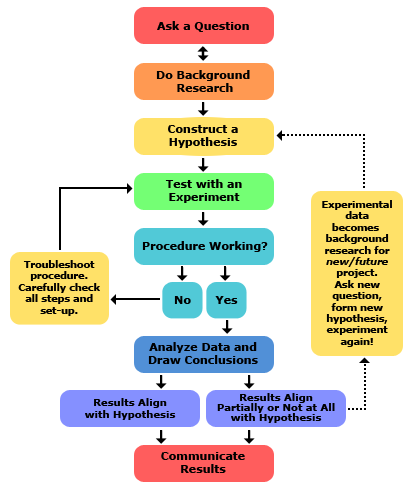 You use the scientific method. In the fourth century B.C., the Greek philosopher and scientist Aristotle argued that abiogenesis is one of four means of reproduction, the others being budding (asexual), sexual reproduction without copulation, and sexual reproduction with copulation. Indeed, the Greek goddess Gea was said to be able to create life from stones. Even Albertus Magnus (Albert the Great), the great German naturalist of the thirteenth century Middle Ages, believed in spontaneous generation, despite his extensive studies of the biology of plants and animals. All right, I can see how maggots apparently magically appearing on rotten meat could make you think they spontaneously regenerate! But, again (I think), only if you're not really paying attention. Jeff and I were talking the other day about hummingbirds. We have four hummingbird feeders around our house, and we love to watch these tiny birds as they hover, sip, and often chase each other around in the air. If you watch them carefully, you can see their tiny little feet, tucked up under their bodies as they fly and hover. And sometimes they perch on the edge of the feeder while they drink the sugar-water we put there for them. They have feet. "They have feet." It seems crazy to have to say that. It seems like an obvious thing to say: Of course hummingbirds have feet. How could we doubt that? Yet I read recently that some ancient Greek "scientists" wrote that hummingbirds DON'T have feet. Really? I seriously wonder about their observational skills. Okay, maybe they never got as close to the birds as we do every day. But, still. Really? So then of course I have to wonder about every bit of "received wisdom" we have from the Greeks, the Romans, the Norse, and everyone else who ever wrote about nature anciently. I remember all that stuff I learned in school about the ancient gods and goddesses of the Greeks and Romans, about how they supposedly made up these beliefs based on observations. If they couldn't see feet on a hummingbird, OBVIOUSLY they would make up a pantheon of supernatural creatures based on hearing thunder, for instance: Oh, there must be a "god" up in the sky bowling. Or when some unmarried and supposedly "virtuous" woman gets pregnant: Oh, some "god" fell in love with her long enough for her to conceive a child, and then (of course, because they're gods, and they don't have to stick around with mere mortals) left her to try to explain it to her family and her village. But here's the thing: If you lack knowledge, whether because you can't see well enough to notice feet on a hummingbird, or because you have drunk in the myths of your ancestors without stopping to think about them, or for whatever reason, you will tend to believe in ideas that seem ridiculous to anyone who knows more than you do. If you don't believe in those other ancients, though, why should you believe in the accepted knowledge and understanding of the ancient Hebrews? And then the ancient Christians? Why believe in that God of the Old Testament or in any of His prophets? Does your modern skepticism about some ancient beliefs preclude you from having your own religious, i.e., non-scientific beliefs? How can I bear my testimony of my Heavenly Father's love and of His Son, Jesus Christ, my belief in their love, and my belief in the restored gospel and modern-day prophets and (of course) the Book of Mormon, if I don't accept any other religions? What makes this different for me? "...the record of his first dramatic production in ca. 498 B.C., and a legend, which runs as follows: 'Aeschylus used to say that once, when he was a teenager, he was guarding the grapes in the countryside and fell asleep. Dionysus appeared standing over him and told him to compose tragedy. When daylight came, since he wanted to obey the god, he tried it, and found it easy from that moment on." "In February 1964, Brodsky, who had left school at fifteen, was tried in Leningrad as a 'social parasite' who had corrupted young people with his 'pornographic' and anti-Soviet verse. In response to the judge's questions about where he had received the authority to write poems, he answered, 'From God.'" 3. I will add others as I find them. Commenters, any additions? I saw the old god of war stand in a bog between chasm and rockface. He smelled of free beer and carbolic and showed his testicles to adolescents, for he had been rejuvenated by several professors. In a hoarse wolfish voice he declared his love for everything young. Nearby stood a pregnant woman, trembling. And without shame he talked on and presented himself as a great one for order. And he described how everywhere he put barns in order, by emptying them. And as one throws crumbs to sparrows, he fed poor people with crusts of bread which he had taken away from poor people. His voice was now loud, now soft, but always hoarse. In a loud voice he spoke of great times to come, and in a soft voice he taught women how to cook crows and seagulls. Meanwhile his back was unquiet, and he kept looking round, as though afraid of being stabbed. And every five minutes he assured his public that he would take up very little of their time. Brecht, of course, had certain petty dictators in mind here, but the parabolic reach of the poem is considerable. When he fled across the top of Europe from Finland to Leningrad to Moscow to Vladivostok and thence by boat across the Sea of Japan and the China Sea, he found himself in water roiled by the same god of war in different guise. We suddenly noticed that our little ship was not moving. It lay against Luzon in the China Sea. Others feared it was German raiders. Preferred the typhoon to the Germans. For more on Brecht, here's an interesting article.